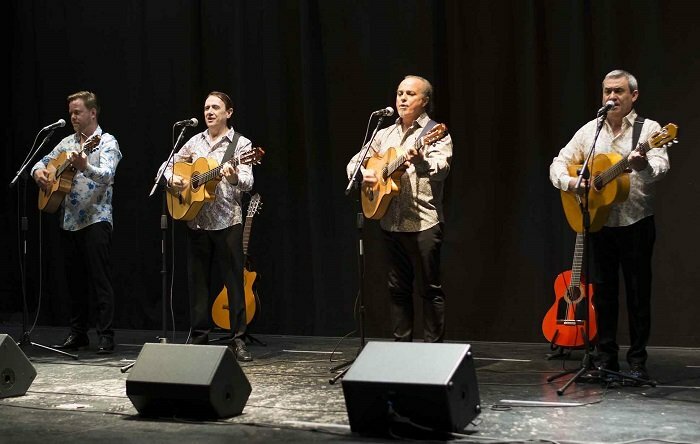 The Rumba Kings is a flamenco ensemble and Gypsy Kings tribute from Seville (Spain) who has been performing on the top hotels and cruise lines all around the globe for the past years. Their renown repertoire makes the experience of their show enjoyable and unforgettable for international audiences as they can fit in any type of event company or guests, no matter what language they speak. Apart from performing as 4 piece band, they are also available with dancers, upon request. – Mediterranean cruise, Holland America Lines (2013). – Kuwait, Regency Hotel (2013). – Marbella, Kempinski bahía Hotel, Estepona, (2015). – Barcelona, Miramar hotel, (2.015). – Madrid, Intercontinental Hotel (2014). – London, "A taste of Spain" (2011). – Milano (Italy), "La Spagna a Milano" (2014). – Bologna (Italy), "La Spagna a Bologna" (2014). – Junta de Andalucía (Spanish government) (2011, 2012, 2013, 2014). – México (Puebla), "El Candelabro" (2013). – Lisboa, "Expo Mundo Abreu" (2012). – Huelva, Gran Hotel del Coto (2013, 2014, 2015). – Sevilla, Hotel S. Rafael (Resort) (2011, 2012, 2013, 2014, 2015, 2016). – Barcelona, Shoko Nightclub (2012). – Madrid, Meliá Hotel (2014). – Marbella, "La Quinta Golf Club" (2015).